I am constantly preaching the need for bloggers to have Google Analytics on their blog during #Blogchat. A big reason why is so you can track changes in your blog, good and bad, so that you can understand why the change happened. Yesterday this blog had 2,235 visitors, which is about 90 more than the previous high for one day. What I want to do is walk you through the stats in Google Analytics to figure out why this happened, and also give you some insights into how you can do the same for your posts. That’s a really strong graph as it shows that traffic for yesterday (blue) was higher than the previous Wednesday during every hour yesterday except for the final one of the day. This is what you want to see, because it indicates that traffic is growing week to week. But the traffic last Wednesday was 1,785, whereas yesterday it was 2,235. That’s a 25% increase, and while I’m thrilled with that jump, I want to figure out why it happened. 1 – Note that there was a BIG jump in search traffic. 2 – While the number of visitors that arrived at the blog from an organic search increased, the percentage of overall traffic that came from search actually went DOWN. 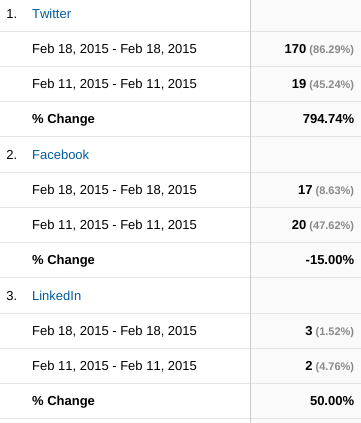 3 – There was a BIG jump in traffic from Social. A-ha! So almost all of the surge in Social traffic yesterday vs a week ago was actually coming from just Twitter. This is my suspicion: As people were sharing my content yesterday on Twitter, it was leading to more links to my content being seeded higher in search results on Google. So the better my content did on Twitter yesterday, it resulted in it also doing better in search results on Google. That would explain why search traffic spiked because overall the two traffic sources that accounted for almost all of the overall traffic bump yesterday were Google and Twitter. Perhaps this is a result of Google indexing tweets into search results? Double A-Ha! 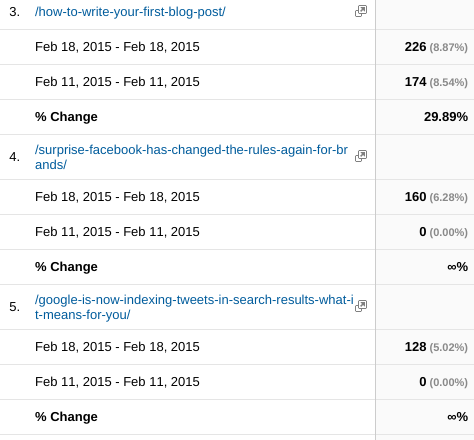 The 4th and 5th most viewed posts yesterday were both new posts I wrote this week. 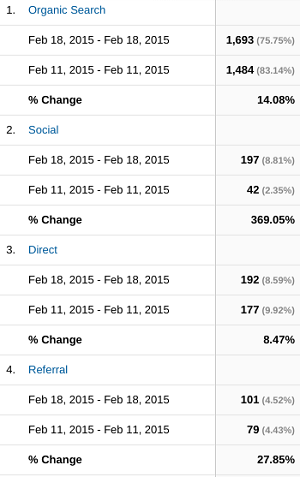 And a big chunk of the overall growth in traffic can be tied back to these 2 posts (288 new visitors). This also gives me important insights into the type of content that resonates with my readers. And since I’ve already looked at the channel data, I know that most of the increase probably came from Twitter, so really I know that these two topics likely resonate with my followers on Twitter. And the beauty of this is I can come back tomorrow and do the same analysis on this post, and compare how it does today vs how the above two posts from earlier this week did. BTW, a big reason why I wanted to write this post is because I have been doing these type of analysis for a while now, and I know that posts that do a deep-dive into actual numbers are popular with readers here. Another advantage to knowing your blog’s stats! The point in all this is to invest time in understanding your blog’s stats so you can improve your blogging efforts and efficiency. If I hadn’t looked at my blog’s stats I would have little idea that yesterday was a record-setting traffic day or more importantly why it was a record-setting traffic day. Now I know, and that knowledge will help me improve my blogging efforts moving forward. Just as it will for you if in you invest the time in understanding your blog’s stats. Mack, as always you provide help and not hype. Your master sleuthing is not only really helpful ( I love how your step-by-step breakout encourages readers to dig down and find out which post is performing and where) but also is a great example of turning a daily routine for yourself into a helpful piece of content for others to learn from. 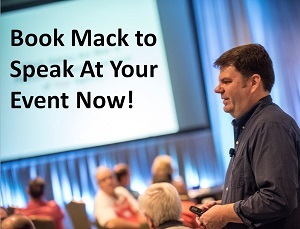 As always, thanks Mack, and congrats on the increase of traffic! Good work does pay off! I agree! Helpful, detailed and honest (as always). Kelly I don’t think I know how to set up email alerts so that GA stats are sent to me 🙂 Of course I check it so often that I probably don’t need them most of the time. And thanks! Email notifications: You can set up an emails to be delivered for any report in GA.
Click on the report you want sent to you and then up in the Nav bar to the left of Export you’ll see the word Email. Click on it and you can schedule when you’d like that sent. What’s great is you can send them daily, weekly or monthly. Perfect for proactively keeping team and management in the know. An overview of all reports being sent can be viewed in your Main GA dashboard under Admin-> scheduled Emails. Thanks Kelly, that’s great, I’ll check this out! Aww, now I get how all of that works. I haven’t tracked traffic for a while now but now that my blog is transitioning into a new direction I am all about numbers and what new readers want. I think I will take your approach and compare stats daily. I have one post that consistently gets new traffic and last week it jumped up 1,000 more views so I’m curious where that came from – Now I can. thanks. Hey Sara! Definitely helps to know what’s causing the spike. For example, I noticed that the post I published today was already getting referrals from Google within a couple of hours. That’s much faster than normal, so I think the cause is it was coming from my tweets being seeded in Google search results! But yes, you definitely need to figure out why that post spiked if you can. Sounds like it suddenly got new traffic from some source, would help you to figure out where. I would start by looking at the views it got last week and see if there was a spike on one day. Then once you figure out which day it spiked, go check your overall traffic for that day and see if you see traffic coming in from a new source. Like if you usually get about 20 clicks a day from Pinterest, but on Weds you got 500, which is the same day your post got an extra 500 views. That probably means it got pinned more that day and sent you extra traffic! Good luck!